In October 2004, University of Manchester’s Andre Geim, along with his colleague Kostya Novoselov, discovered published their discovery that when a block of graphite is broken down to just 10 or 100 layers thick, a material known as graphene emerges1. With substantial material properties involving its superior strength as well as both heat and electricity conductibility, while remaining such a thin material, graphene has become one of the most studied materials to date. While graphene is most often employed in disciplines such as bioengineering, composite materials, energy technology and nanotechnology, its ability to be interjected with other elements allows for its applications to be limitless. One of the most pressing challenges that the graphene industry faces is a lack of pure production of the material. A recent research report conducted by the Centre for Advanced 2 D Materials (CA2DM) at the National University of Singapore has found that most graphene production companies generate a material that is comprised of a graphene content of only 2-10%2. Canadian based company Elcora Advanced Materials Corporation has become one of the leading graphene producers in the world, while also maintaining products comprised of 55% graphene content. As its unique designed processing technology not only works towards achieving the purest form of graphene possible, Elcora ensures the cost effective production of graphene from natural graphite in a green and efficient manner. By minimizing the need for using harsh chemicals, while also eliminating the environmentally damaging byproducts or waste that often follow graphene production, Elcora is one of the most environmentally safe graphene plants available today3. After acquiring control of the Ragedera graphite mine located in Colombo, Sri Lanka, Elcora Advanced Material has been able to successfully produce an estimated 18,000 tonnes of high quality graphite per year. Learn more about the Ragdera Graphite Mine. With production bases located in both South Wales and Seoul, Korea, Haydale Graphene Industries is one of the numerous companies working towards enhancing the carbon fiber composites for specific aerospace and automotive needs. In doing so, research conducted by both Haydale and scientists from the School of Engineering at Cardiff University have investigated how the addition of graphene nanoplaatelets (GP) and carbon nanotubes (CNT) into the composites can allow for reinforcing benefits of the technology. These benefits include an increased resistance and tolerance to damage of the vehicle, while also showing a 13% increase in the compression strength following impact performance studies. By positively influencing composites such as aircraft wings and automobile parts, Haydale has improved these important properties that are required for maintaining such high performance structures4. In addition to achieving such impressive material improvements, the techniques employed during this process were performed in a much more cost effective, green and efficient manner. The process employed in the development of this composite involved treating the surface of the nanomaterials with Haydale’s low temperature and low energy HDPlas ® plasma process4. This plasma functionalization process not only produces high integrity materials, but also avoids the typical waste production associated with functionalization processes while simultaneously promoting homogenous dispersion and chemical bonding. Haydale researchers are hopeful that this newly developed material can allow for lighter and stronger wings to be implemented into aircraft deisgns that can simultaneously reduce the amount of carbon dioxide emissions released by these aircrafts. Rahul Nair from the University of Manchester in the United Kingdom has recently developed a method involving the use of graphene oxide in order to effectively desalinate water. Considered to be the oxidized form of graphene, graphene oxide membranes have recently emerged as an excellent membrane material that is capable of separating multiple different types of molecules and ions present in an aqueous solution5. The sieving potential of graphene oxide membranes has been successful in removing small nanoparticles, organic molecules and large salts from solution; however, their ability to filter out common salts has not been documented until now. Previous attempts at employing graphene oxide membranes in the filtration of smaller salts in water have caused the membranes to expand and prevent the flow of water from entering the pores of the membrane. By placing walls composed of a substance known as epoxy resin that is typically used in glues and coatings on either side of the graphene oxide membrane, the team of researchers led by Dr. Nair was able to successfully prevent the swelling of the membranes upon its immersion in water6. With a uniform pore size within the membrane of only 0.9 nm in width, this highly selective graphene oxide membrane has several advantages as compared to its bulk counterpart, graphene7. As a much more inexpensive option coupled with a long operational lifetime, graphene oxide membranes have a spectacular separation potential that could have a significant impact in a wide variety of energy reduction and environmental conservation industries around the world. Outside of its potential for water purification purposes, researchers believe that this technology could also provide a useful addition in the dehydration and purification of biofuels. In most biofuel processes, water is formed as a byproduct, and its presence in the biofuel can affect the final product in a detrimental way. Therefore, the hope is that the application of graphene oxide membranes in this industrial process could have an advantageous use. Similarly, graphene oxide membranes have a well-documented gas separation ability that prevents any vapor molecules from passing through the membrane. In one of the first studies illustrating this property, researchers measured the loss of weight within a containing initially filled with alcohol before and after it was sealed with a graphene oxide membrane8. Following the membrane sealing, researchers found that no noticeable variation in the weight of or the pressure within the container was detected. As a result of this remarkable gas separation property, researchers are hopeful the use of graphene oxide membranes can be applied to the controlling of greenhouse gas emissions, as well as the purification of hydrogen-related clean energy gases, in future real world applications. The University of Cambridge has recently developed a highly conductive ink known as ‘Graphene – IPA Ink.” Composed of powdered graphite dissolved in alcohol, this ink has the potential to be used in inkjet printers that print electrical circuits onto paper. By forcing the ink through a micrometer-scale capillary at an extremely high pressure, the resulting product is a smooth and conductive material9. Researchers are hopeful that devices such as Radio Frequency Identification (RFID) antennas, passports, electronic tags, and similar everyday items can be printed at a much cheaper rate with the application of electronic circuits printed using this graphene ink. While graphene may appear to be a single product, it has developed into several different types of applications in its short 13-year live span since its first entrance into the scientific world. Its wide range of uses allow for this material to have a promising future, in which its varying and impressive properties of transparency, strength and conductivity can improve almost every industry of the world. The world of two-dimensional materials, like graphene, have allowed for researchers to manipulate different geometries and combinations of these compounds to create wonderful new products of the future. As research and development projects continue to work on graphene and its numerous applied products, new two-dimensional materials continue to be discovered each day in continuance of this revolutionary pathway that has set by graphene. “This Month in Physics History.” American Physical Society. 22 Oct. 2014. Web. https://www.aps.org/publications/apsnews/200910/physicshistory.cfm. “Graphene R&D.” Elcora Advanced Materials. Web. https://www.elcoracorp.com/graphene-rd/. Ecclestone, Christopher. “Analyst on How Elcora Has Positioned Themselves as a Leader in the Graphite Space.” InvestorIntel. 06 Apr. 2017. Web. https://investorintel.com/sectors/technology-metals/technology-metals-intel/elcora-pulling-ahead-leadership-graphite-space/. “Carbon Fibre Composites.” Haydale. 11 Nov. 2014. Web. http://www.haydale.com/news/graphene-toughened-composites-a-milestone-for-next-generation-aerospace-structures/. An, Di, Ling Yang, Ting-Jie Wang, and Boyang Liu. “Separation Performance of Graphene Oxide Membrane in Aqueous Solution.” Industrial & Engineering Chemistry Research 55.17 (2016): 4803-810. Web. Rincon, Paul. “Graphene-based Sieve Turns Seawater into Drinking Water.” BBC News. BBC, 03 Apr. 2017. Web. http://www.bbc.com/news/science-environment-39482342. Wilkinson, Jake. “Developing Graphene Oxide Membranes for the Purification of Water and Green Fuels.” AZoNano.com. 22 Sept. 2016. Web. http://www.azonano.com/article.aspx?ArticleID=4275. Joshi, R.k., S. Alwarappan, M. Yoshimura, V. Sahajwalla, and Y. Nishina. “Graphene Oxide: The New Membrane Material.” Applied Materials Today 1.1 (2015): 1-12. Web. “Conductive Graphene Ink Wins Science Photography Competition’s Top Prize.” Phys.org. Web. https://phys.org/news/2017-04-graphene-ink-science-photography-competition.html. The natural structure found within leaves could improve the performance of everything from rechargeable batteries to high-performance gas sensors, according to an international team of scientists. The researchers have designed a porous, such as the veins of a leaf, and could make energy transfers more efficient. The material could improve the performance of rechargeable batteries, optimizing the charge and discharge process and relieving stresses within the battery electrodes, which, at the moment, limit their life span. The same material could be used for high performance gas sensing or for catalysis to break down organic pollutants in water. To design this bio-inspired material, an international team comprising scientists from China, the United Kingdom, United States and Belgium is mimicking the rule known as ‘Murray’s Law’ which helps natural organisms survive and grow. According to this Law, the entire network of pores existing on different scales in such biological systems is interconnected in a way to facilitate the transfer of liquids and minimize resistance throughout the network. The plant stems of a tree, or leaf veins, for example, optimize the flow of nutrients for photosynthesis with both high efficiency and minimum energy consumption by regularly branching out to smaller scales. In the same way, the surface area of the tracheal pores of insects remains constant along the diffusion pathway to maximize the delivery of carbon dioxide and oxygen in gaseous forms. Murray’s Law for the fabrication of the first ever synthetic ‘Murray material’ and applied it to three processes: photocatalysis, gas sensing and lithium ion battery electrodes. 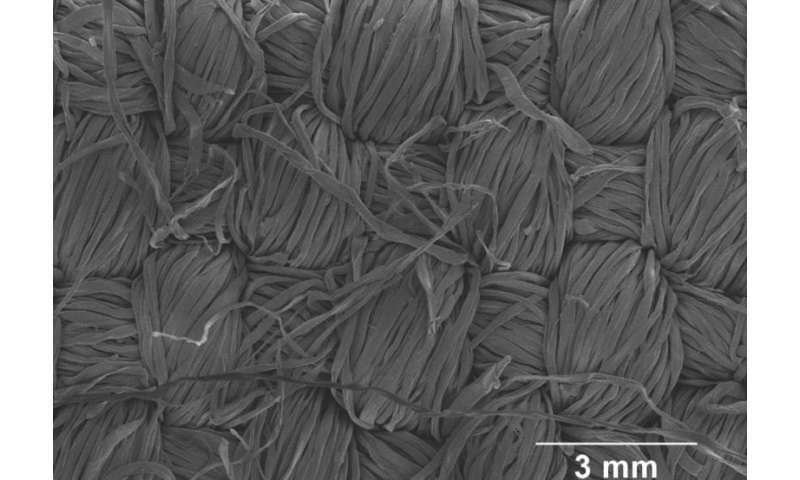 In each, they found that the multi-scale porous networks of their synthetic material significantly enhanced the performance of these processes. Writing in Nature Communications this week, the team describes how it used zinc oxide (ZnO) nanoparticles as the primary building block of their Murray material. These nanoparticles, containing small pores within them, form the lowest level of the porous network. The team arranged the ZnO particles through a layer-by layer evaporation-driven self-assembly process. This creates a second level of porous networks between the particles. During the evaporation process, the particles also form larger pores due to solvent evaporation, which represents the top level of pores, resulting in a three level Murray material. The team successfully fabricated these porous structures with the precise diameter ratios required to obey Murray’s law, enabling the efficient transfer of materials across the multilevel pore network. With its synthetic Murray material, with precise diameter ratios between the pore levels, the team demonstrated an efficient breakdown of an organic dye in water by using photocatalysis. This showed it was easy for the dye to enter the porous network leading to efficient and repeated reaction cycles. The team also used the same Murray material with a structure similar to the breathing networks of insects, for fast and sensitive gas detection with high repeatability. The team proved that its Murray material can significantly improve the long term stability and fast charge/discharge capability for lithium ion storage, with a capacity improvement of up to 25 times compared to state of the art graphite material currently used in lithium ion battery electrodes. The hierarchical nature of the pores also reduces the stresses in these electrodes during the charge/discharge processes, improving their structural stability and resulting in a longer life time for energy storage devices. The team envisions that the strategy could be used effectively in materials designs for energy and environmental applications. The new design, by researchers from the University of Cambridge, overcomes one of the key technical problems hindering the commercial development of lithium-sulphur batteries, by preventing the degradation of the battery caused by the loss of material within it. The results are reported in the journal Advanced Functional Materials (“Advanced Lithium-Sulfur Batteries Enabled by a Bio-Inspired Polysulfide Adsorptive Brush”). University of Cambridge: “Nano-Marbles” Create Intriguing New Materials – Opening Up Applications for Smart Clothing – Buildings – Banknote Security. Researchers have devised a new method for stacking microscopic marbles into regular layers, producing intriguing materials which scatter light into intense colors, and which change color when twisted or stretched. Researchers at the University of Cambridge have devised a method to produce “Polymer Opals” on an industrial scale. The above post is reprinted from materials provided byUniversity of Cambridge. The original story is licensed under aCreative Commons Attribution 4.0 International License. Note: Materials may be edited for content and length. Researchers from the University of Birmingham (which lead the research), University of Cambridge and National Centre for Nanoscience & Technology in Beijing designed the world’s thinnest, tunable, lightweight graphene-based lenses. The project focused on designing Fresnel lenses, which are flat lenses consisting of concentric rings. The rings diffract light to create constructive interference. The other advantage of these lenses is that their optical performance can be tuned by changing the electrical properties of graphene. The lenses are one atom layer thick, with focusing properties that can be tuned by applying an electric field and by changing the number of graphene layers. The lenses act like microscopic versions of the ones used in lighthouses and could help focus light onto small pixels (for example, in cell phone cameras or a route laser light in computer chips that move data with photons instead of electron). The researchers built the 50-µm-wide lenses by depositing 0.335-nm-thick layers of graphene on glass (using CVD) and then carved out the concentric circles with photolithography. 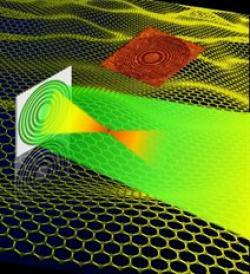 The graphene rings diffract light as it passes through the lens. The team found that the intensity of the focused light doubled when they went from five-layer to 10-layer versions of the lenses. The lenses focused 850-nm light, in the near-infrared range; however, the teams are now looking at designing lenses that work at terahertz frequencies, which have promising applications in security, spectroscopy, and biological imaging. 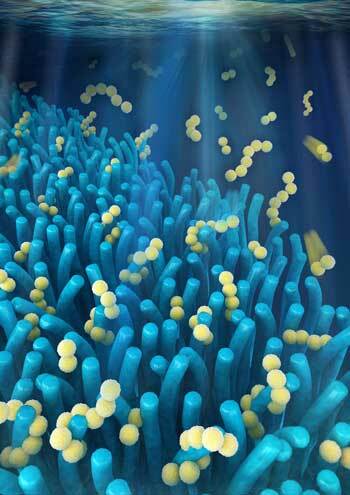 University of Cambridge: A New Class of Biosensors Basis for New Drug Delivery Systems. The interplay between the lipid spheres, called giant vesicles, and the strands of DNA produces a unique response when the material is exposed to changes in temperature. Instead of expanding when heated – as is normally the case – the material contracts, a phenomenon known as negative thermal expansion. Details are published today (7 January) in the journal Nature Communications (“Thermal regulation of volume and porosity in lipid mesophases by coupling mobile ligands to soft membranes”). Basing self-assembled materials around vesicles – synthetic versions of the soft sacs which envelop living cells – allows for even more flexibility, since the vesicles are so easily deformable. Using short DNA tethers with a cholesterol ‘anchor’ at one end and an exposed sticky DNA sequence at the other, the vesicles can be stuck together. When assembled into a hybrid DNA-lipid network, the DNA tethers can diffuse and rearrange, resulting in massive vesicle shape changes. Besides negative thermal expansion, the researchers also found that changes in temperature lead to a significant variation in the porosity of the material, which is therefore highly controllable. A similar response is expected by changing the concentration of the DNA tethers, which could also be replaced by other types of ligand-receptor pairs, such as antibodies. This research is part of the CAPITALS, a UK-wide programme funded by the Engineering and Physical Sciences Research Council (EPSRC). Cambridge Enterprise, the University’s commercialisation arm, is currently looking for commercial partners to help develop this material. Theoretically expected, it was now experimentally proven by scientists for the first time that the fascinating new material graphene is also highly efficient at converting light into electricity–which makes it an ideal candidate to boost the sensitivity of imaging sensors and also to increase the maximum conversion efficiency of photovoltaic cells. This illustration shows lithium atoms (in red) adsorbed to a layer of graphene to create electricity when the graphene is bent, squeezed or twisted. Current materials used for these applications include silicon and gallium arsenide, but they just generate a single electron for each photon absorbed. Since a photon contains more energy than one electron can carry, much of the energy contained in the incoming light is lost as heat. Graphene on the other hand can generate multiple electrons from absorbing one photon, according to theoretical research that was now confirmed in the lab as described this week in Nature Physics. Previous work had inspired hope that graphene had this property, says Frank Koppens, a group leader at the Institute of Photonic Sciences in Spain, who led the research. To conduct the experiment, the researchers used two ultrafast light pulses. The first sent a known amount of energy into a single layer of graphene. The second served as a probe that counted the electrons the first one generated. Koppens said he is “reasonably confident” that the group can enhance the performance of light sensors like those used in cameras, night vision goggles, and certain medical sensors quite soon–after all, his lab is already working on a prototype device to demonstrate the new found capability of graphene. A second but more difficult application would be solar cells. The material could help to increase the theoretical efficiency limit to about 60%, about twice as much as the 30% limit possible with today’s silicon cells, which currently reach about 20% in the field and 25% in the lab. But Koppens cautions that key engineering challenges stand in the way of that, which includes figuring out how to extract power from a system at all. The new paper illustrates a “very important concept,” since future devices will depend on an understanding of the physical processes that occur when graphene absorbs light, says says he and colleagues have a still-unpublished paper that describes a similar result. Demonstrating this property in graphene opens a promising new field of research, he says. Graphene was already exciting as a photovoltaic material because of its unique optical properties, says Andrea Ferrari, a professor of nanotechnology at the University of Cambridge in the U.K. who was not involved in this research. The material “can work with every possible wavelength you can think of,” he says. “There is no other material in the world with this behavior.” It is also flexible, robust, relatively cheap, and easily integrated with other materials. The new research “adds a third layer of interest to graphene for optics,” he says. Among Koppens’s collaborators were MIT physics professor Leonid Levitov and Justin Chien Wen Song, a graduate student in Levitov’s lab, who helped Koppens interpret the data through theoretical modeling.